Nonetheless, the New York Times reported on Sunday that A&E is all set to premiere its eight-episode Generation KKK series in January. 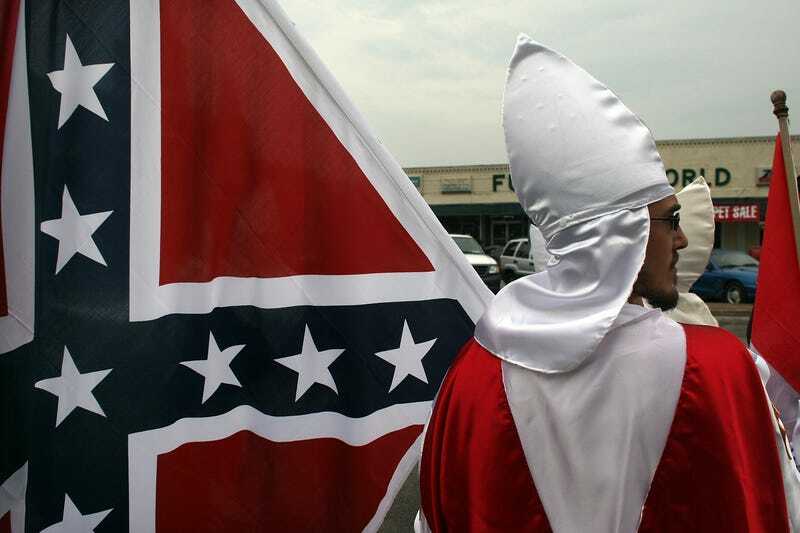 The show consists mainly of footage obtained from cameras embedded within the KKK community (with permission) over the last year, with subjects including “an ‘Imperial Wizard’ trying to recruit his daughter into the KKK, [and] an Iraq veteran indoctrinating his four-year old son with racist rhetoric,” according to The Hollywood Reporter. No names are changed or faces blurred, according to THR, and I suspect that has something to do with the fact that, with Trump as President-elect, this group of white supremacists—whose legacy mainly consists of threatening, torturing, and murdering black people—don’t feel they need to be ashamed of anything. General manager of A&E Rob Sharenow told the Times, “We certainly didn’t want the show to be seen as a platform for the views of the KKK. The only political agenda is that we really do stand against hate.” This may not have been A&E’s intention, however the show does give an additional platform to the KKK, which is a hate group. You would think, given their outsized voice in the American media, that Klan members are abundant, when in fact, as the Times notes, their ranks are estimated at somewhere between 3,000 and 8,000 members. They couldn’t fill a football stadium or even one tenth of a football stadium. I’m not saying don’t give the show a chance if you’re genuinely curious, but I think most of us already know what the KKK is about.